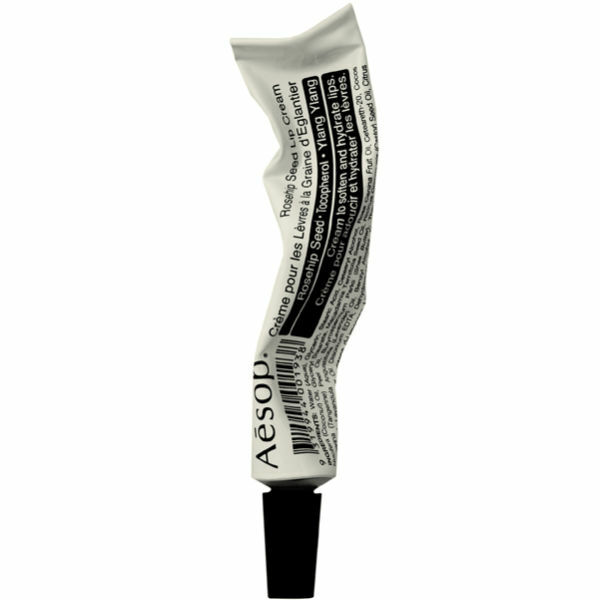 Enrich your sensitive lips with a dose of Aesop Rosehip Seed Lip Cream 6ml, a soothing concentration of vitamins A and E. Your pout will feel instantly hydrated and moisturised, but you won't experience that annoying sticky feel you get with many other lip balms. The formula is designed to be absorbed into your lips quickly and the floral scent will linger, leaving a delicate aroma around your mouth. 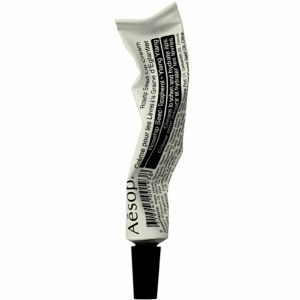 Aesop Rosehip Seed Lip Cream 6ml is designed for frequent applications. You can smooth on some of this silicone and paraffin free balm as often as you please, apply directly to the lips. Rosa Canina Fruit Oil- An excellent source of Oleic, Linoleic and Linolenic acids. Renowned for its skin regenerative properties. Tocopherol- The active constituent is Vitamin E, which primarily acts as an anti-oxidant. Cananga Odorata Flower Oil- Complete steam-distilled essential oil, hydrates and balances skin. its very nice and i like it. Has a very soothing herbal scent, vintage package and design, and the texture is cream instead of balm,which is very suitable to use before matte/velvet lipsticks, does not change the texture of your lipstick. The product itself is very soothing and hydrating, not oily at all. I would recommend it to my friends who are looking for a lip care product hydrating enough but leaves no glossy finish. One of the lip shells got cut badly by the shipment and it is hardly useful as I have already reviewed by email. The Mankind had no reply of my email. I love it smell and very moisture. this brand is so popular in China now ,and many friends love it ! Coated with light rose fragrance, the lip is very moisturizing, night use words the next morning up chapped lips get very good repair. So far the best lip balm I've ever used! Apply it before lip blam, makes your lip soft. The rosehip seed lip cream is light and absorbed fast. Unlike any lip balm, it doesn't give you the shinny look and it is absolutely non greasy. The smell is pleasant too. This is a very worth try products, daub after the lips without any sense of burden and massiness. Light moisturizing experience is perfect! So far the best lip balm I've ever used! Try it once, you will love it. Rosehip Seed Lip Cream is very good. Helpful for my dry lips, excellent in winter. Highly recommend. This one is really good lip cream. It smells good, too. It is not feel very oil like other lip butters. You can try it ! The product itself is lovely it smells nice and really moisturises lips. Only bad point is the tube as soon as the lid is taken off the cream comes out really quickly and won't stop until the lid is put on and at times the cream goes everywhere resulting in a lot of wasted cream as you only need a tiny bit! I love their products but the lip cream for me is too thin. The smell is ok but the consistency is like a thin cream and I prefer a thicker consistency. Dosent really have a masculine scent and smells like perfume for the older lady. It is a cream which unfortunatly in this weather of snow wind and rain just does not do anything to stop your lips getting chapped. However i cant imagine it giving any uv protection in the sun either. Overall very poor unfortunately however does make lips a bit softer if left on over night.